Friend of the poor. Brother to all creation. A man of poverty. A man of peace. Born in Assisi, Italy around 1181 A.D., Francis led an untamed life in his youth, enjoying the excesses of a wealthy family. About age 20, he became a soldier, but ended up in prison and soon fell ill. Through a vision, he began a different life when he was released, one filled with prayer and service to the poor. He gave away his worldly goods and dressed in a simple peasant’s tunic with a rope for a belt. He befriended beggars and began to travel the countryside, imploring people to do penance and to practice brotherly love. Because of the care St. Francis showed others through his remarkable life of simplicity, many of those who had earlier mocked him became his followers. Soon they became known as Franciscans. 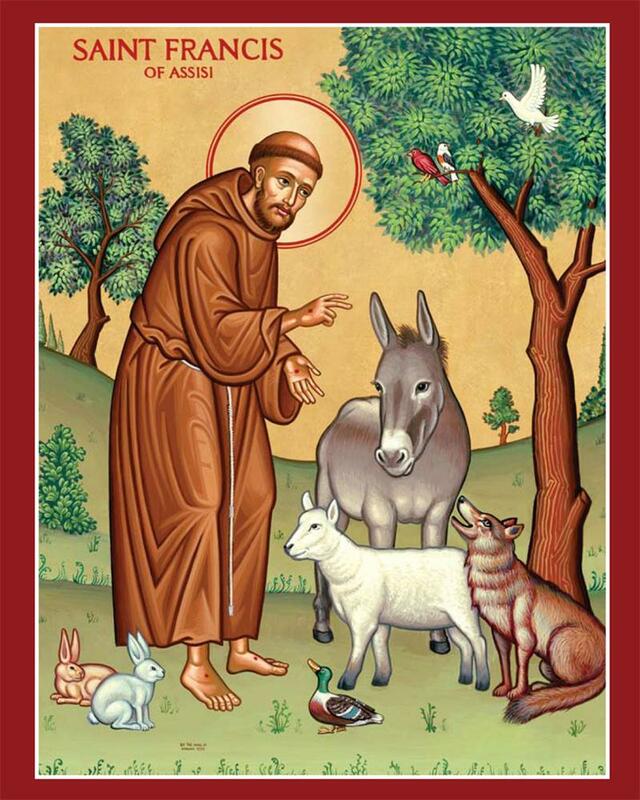 St. Francis died on Oct. 3, 1226 in Assisi. His feast day is Oct. 4, when household pets are traditionally brought to church to be blessed, in much the same way Francis cared for animals as part of God’s larger creation. When the former Cardinal Jorge Mario Bergoglio became pope in 2013, he chose to be called after St. Francis of Assisi. "How I would like a church that is poor and that is for the poor," Pope Francis told media representatives just after his election by the conclave of cardinals. Bishop John Leibrecht, bishop emeritus of the Springfield-Cape Girardeau Diocese, chose the name for this new parish in Nixa when it was formed in 2004. We celebrate his Feast Day with a Mass followed by the blessing of pets. According to Franciscan tradition, the cross of San Damiano was instrumental in the life of St. Francis. It was while praying before this cross in the chapel of San Damiano, just outside Assisi, that he received a call to rebuild the Church. 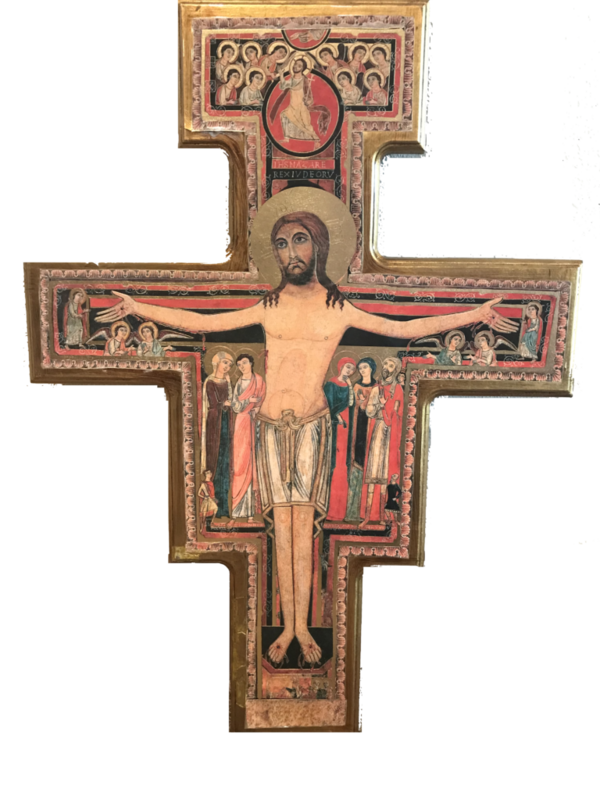 The cross now hangs in the Basilica of Saint Clare in Assisi, Italy, with a replica in its original position in the church of San Damiano nearby. In addition to the image of Jesus, the cross portrays a deeper story depicting the witnesses of the crucifixion, the Virgin Mary, St. John the Evangelist, Mary Magdalene, Mary Mother of James, St. John, St. Michael, St. Rufino, St. John the Baptist and St. Paul to name a few. Our parish uses the San Damiano cross with each procession into the church, and on the altar of every Mass. 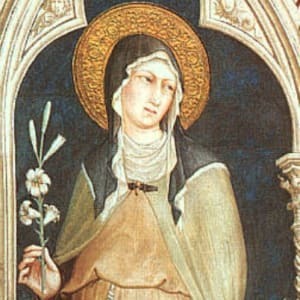 Our chapel at St. Francis of Assisi Parish is named for her.